IBSurgeon HQbird is an advanced distribution of Firebird for enterprises with big databases. It is an enhanced, fully compatible, feature-rich distribution of FirebirdSQL that provides superior performance, reliability, and instrumentation. You can use HQbird with existing Firebird databases without any change in the database structure or metadata, without backup/restore, triggers, etc. 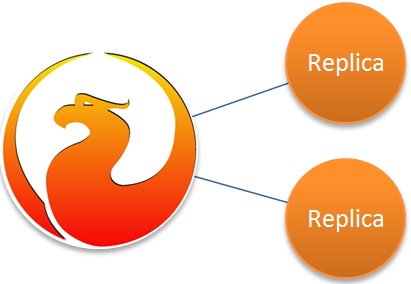 You can revert to standard Firebird at any time, without any changes or backup/restore, too. Download trial version of HQbird now, and improve your Firebird in a few minutes. Synchronous - to build Firebird failover cluster to create a fault-tolerant solution with almost real-time synchronization. HQbird users run asynchronous replication with 400+ connections without noticeable performance degradation (2-4%). Want to try it now? Download and follow this instruction! HQbird Enterprise also includes the recovery toolset to fix corrupted databases, corrupted backups and to undelete occasionally deleted records. Trace API for Firebird 2.5 and 3.0: FBPerfMont stores monitoring logs in the Firebird database, and GUI to analyze queries, transactions, connections. MON$ tables: MON$Logger performs sophisticated analysis of Firebird monitoring tables snapshots. Gstat: IBAnalyst performs an analysis of the database structure statistics and provides recommendations how to improve database performance. 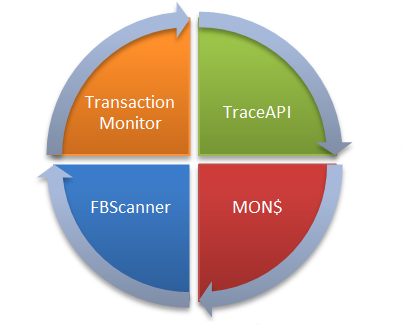 Transactions analysis of Firebird transactions markers, by FBDataGuard and IBTM, with detection of long running transactions and stuck transactions. Also, HQbird includes FBScanner, which is the only tool to profile old Firebird and InterBase versions (1.0-2.5). And, HQbird contains set of Firebird configuration files, optimized for better performance. HQbird also implements other necessary Firebird maintenance procedures: sweep, test restore, indices statistics recalculation. Also, HQbird has support for VSS backup in virtual machines. 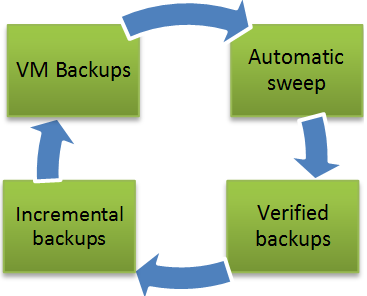 With HQbird, you will never lose or overlook an important backup, even if you have many databases in various locations. HQbird permanently monitors your Firebird database and server: more than 30 parameters are monitored to ensure an availability of your business data. HQbird (all editions) supports HQbird Control Center - the 2nd level monitoring infrastructure, which enables monitoring of hundred of Firebird servers (Control Center is available as a separate product or monthly subscription). In the case of a problem, you’ll get an alert before things go bad.